Any of his stuff from this era, honestly. Superb. I can't decide whether I love the deep character shots set to Joe Hisaishi's score or the artfully sparse silent shots more. Perhaps it's the contrast between the two styles that accentuates the strength in each. Needed less violence and more of Kitano and his wife and the suicidal partner with the weird paintings. Not that I don't enjoy Kitano killing people, but there was really no point in making him a stoic badass again in this one - his two relationships were way more interesting, and the film is ultimately held back by how much runtime is devoted to the Yakuza side plot. Just the editing that Godard was trying to get at. Highly refreshing how unconventionally this story is told, and unexpectedly humorous in the process. The score is beautiful, but the film is super slow and definitely not for those with a strong allergy to pretentiousness. Rogue cop surrounded by violence & death seeks comfort & meaning the only way he knows. Deep tragicomic sense of melancholy, loss & resignation but also redemption & tenderness. Focus on emotional reflection over plot pays off in a rich eclectic tone. 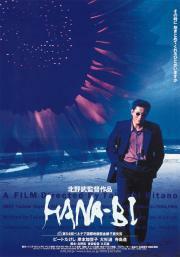 Kitano's deadpan performance is that of a wounded animal & his evocative vision is evident in every deliberate shot/cut. Forcefully beautiful in good & less good. The paintings were pushing it & the two sounds at the end were needlessly cliche tbh. Top badass moment? Nishi pulling apart a little girl's kite. On the off-chance that doing so was making a profound statement I'm going to say it's badass, but to me it just looked mean. This is a satisfyingly sad watch, but disappointingly it doesn't have the gravitas or emotional depth of a film such as, for example, "The Emoji Movie". The music is horrible too and it was all in foreign for goodness sake. I don't understand art either. At least 5 cats, no chainsaws or decapitations. I didn't find it technically outstanding as someone told me. Neither so much poetic. But it's well directed and it has some sensibility, yes. The Kitano style that mix humour, violence and introspective scenes works well in entertaining, less in give to the film something to remember: There are a lot of characters and barely we end up to know well one of them, in a characters driven film about a deep life-crisis. Given the theme, a Yin&yang showcase is not enough, neither a bittersweet mood. The action in Hana-Bi is instantaneous. It punctuates long, ruminative scenes that dwell on people coping with loss, alienation and existential crisis. I think Joe Hisaishi's plaintive score actually complements this mood without being mawkish or instructive. The violence itself always feels like an unwelcome distraction that's treated with contempt and quickly disposed of, not only for Nishi (who is a great anti-hero), but for the film itself. Totally unique, and so are Takeshi's paintings. Kitano's breakthrough is a beautifully bleak film haunted by the spectre of death; a strong melancholic tone prevails, highlighted by the vivid use of blue and silent passages which emphasize the things that his characters do not say but feel. It's a small film defined by delicate contrasts: balancing beauty and ugliness, grace and rage, life and death, Kitano skillfully punctuates moments of sullen serenity with extreme violence, suggesting a worldview that is both brutal and tender.